CLIMB hosts Hike the Heights in Northern Manhattan for hiking on the "Giraffe Path" and a community party with arts, games, healthy food, and active fun! Hike the Heights 7 thanks you for food and relief! Open spaces and parks in large urban areas are invaluable! The quality and vibrancy of these spaces is enhanced by regular use by all sorts of people (from toddlers to seniors, from joggers to strollers). Northern Manhattan has an extensive network of paved and unpaved trails that can take a hiker from 110th to 218th street through beautiful urban and natural vistas. Segments of the trail network would benefit from regular maintenance by volunteers, but most importantly, they would benefit from increased foot traffic (and bike, rollerblade, wheelchair, stroller traffic as well!). Unfortunately, many of these trails have been forgotten by locals who retreated from open spaces and parks during the height of the violence epidemic that plagued Northern Manhattan in the 1980s and early 1990s. The parks and nearby neighborhoods have come a long way and have been largely restored by the City Parks Department and volunteer groups. The task that remains is to invite neighbors and visitors to come out and learn about and fall in love with these trails. We have found that once people become engaged, they are more likely to be involved in stewardship and other volunteering activities. CLIMB partners lovingly refer to the network of trails as the "Giraffe Path." - outreach to past and new community partners - hold planning meetings (plan hikes and community party) - outreach to past and new sites for giraffe making workshops - coordinate giraffe making trainings (date, time, location, number of people participating) - hold park clean up days for removing litter and maintaining trails - arrange community party logistics (food, tables, chairs, etc) -set-up Giraffe Path installation - have a great community day in the beautiful parks! 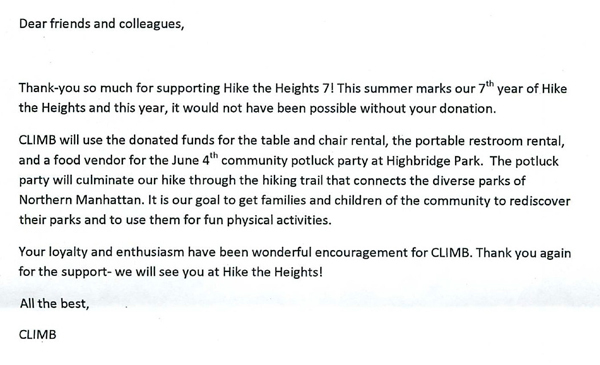 On June 4, 2011, CLIMB (City Life Is Moving Bodies) and its community partners will host Hike the Heights 7. 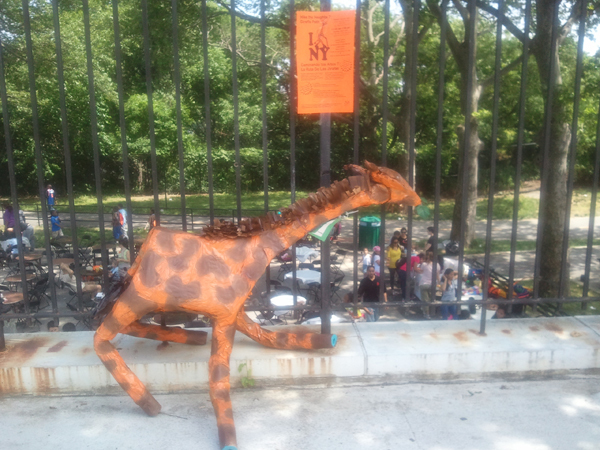 This is an annual volunteer planned and run community event that links people with their beautiful parks in Northern Manhattan and promotes the â€œGiraffe Path,â€ a trail that connects 7 parks and surrounding neighborhoods. The event brings together people of all ages in their parks for hiking and a community party with arts, games, healthy food, and active fun! Connecting people with the Parks and Nature in their Backyards: By showing people the wonderful resources and natural beauty in their parks, Hike the Heights encourages people to be engaged with and use the parks, which makes them safer for everyone. Building Community through the Arts: Leading up to the event, CLIMB and its community partners host giraffe making sessions with local children from Head Start groups, pediatric clinical facilities, and local schools. The child-created giraffes, which are made from recycled materials, are used to decorate the parks during Hike the Heights. Environmental Stewardship: Also leading up to the event, CLIMB and its community partners host days to clean up the parks and to maintain the trails! All of the activities of Hike the Heights are only possible with the generous support of people like you! So please, donate, volunteer, and join us for Hike the Heights 7!